See how walls become tools at the IdeaPaint HQ in the final installment of our three-part Work Design NOW research series, sponsored by Haworth. This is the final post in a series of three reports showcasing the winners of the Work Design NOW 2014 competition, which was sponsored by Haworth. Check out the video above, then settle in to 25+ pages of images, floor plans, and inside scoop in the full case study. The case study is chock full of images, floor plans, and interviews with IdeaPaint employees, the Fusion design team, a Haworth workplace strategist, and our very own Bob Fox. The text of the case study, along with select images, is copied below. In February 2014, IdeaPaint moved into a new 7,600 square foot headquarters in downtown Boston. The space, designed by Fusion Design Consultants, is both a working showroom and an open and flexible office environment for the inventors and purveyors of dry erase paint. Increased its ability to attract and retain talent by moving the headquarters to downtown Boston from suburban Ashland, Mass. IdeaPaint’s new HQ is open and interactive, with plenty of writing surfaces for idea-building. Photo by Neil Alexander. Every wall in IdeaPaint’s new HQ—except for, at the moment, one in the lobby—is coated with the simple, revolutionary dry erase paint that the company invented and sells. On top of serving as a super-collaborative corporate HQ, the 7,600 square foot space is also a showroom, and they chose the new location with that in mind. The walls interact with the people and become another tool just like the desk. The main entrance to the space. Photo by Neil Alexander. They also regularly host design industry events, and recently launched a series of bi-monthly “Studio Sessions”, where they feature work of a local artist or designer on their wide swaths of dry erase paint and invite Boston’s creative community to check out the space. At the time of our visit, the illustrator Derek Cascio’s work was on the walls. If the success of the modern business relies on the ability to communicate and iterate ideas, then finishes like IdeaPaint may be our simple key to the future. IdeaPaint does the work of turning walls into tools, just like a desk is a tool, or a computer is a tool. Stephans said that they often use the analogy of a sports arena—a space where every inch has been maximized for revenue. In offices, just like sports arena, companies are paying for all the walls, but where some businesses use them only for aesthetic effect, IdeaPaint has activated them. IdeaPaint’s walls are a communication tool for their employees. Photo by Neil Alexander. IdeaPaint employees report that they’ll use the walls to collaborate on ideas and to communicate and track leads. When they come to work the next day—or when a coworker walks by, perhaps with more information—they can build on those thoughts. 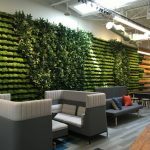 “From a design perspective—being creative, doing things organically on the wall versus finalizing them in a print out or a drawing or a typed out memo, there’s more organic feel to it and it’s less final so it can continue to change and move,” said Veronica Emig, a project manager at Fusion. Flexibility was a key driver behind the design of the new space. Stephans worked with the designers to create an open and vibrant environment; one where employees could balance personal and communal needs in a collaborative environment with designated private spaces for focused work. When they first moved in, everyone had an assigned desk, but now, especially as new hires arrive, the employees move around. Where there is a difference in work, a natural divide has emerged: the finance and operations team occupy one side of the office, and the sales, marketing, and customer experience teams—an altogether rowdier bunch—sit together on the other. They’re joined in the middle by what they’ve dubbed “the hive”—an open kitchen and gathering space where the employees interact throughout the day, regardless of job title. There is a long table where employees can sit and work individually or collectively. They call it the hive because of the “buzz” that occurs there throughout the day. The common kitchen area has been dubbed the “hive” because of all the buzz that occurs there. Photo by Neil Alexander. 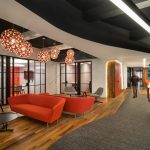 “We even emphasized this through the finishes, where the carpets are darker deeper within the office and they pull together towards [the hive],” said Peters. They mirrored this in the ceiling, too, leaving it open within the work area but then lowering it with a built-in a soffit, painted in IdeaPaint’s recognizable bright blue, to highlight the hive. Giving employees the freedom to do work anywhere within a space is a valuable strategy. On top of that, the old office was 35 miles outside the city. The majority of IdeaPaint’s employee base was already living in downtown Boston, so the move to the city was a no brainer. The leap of faith was to have a completely open, team-oriented, and collaborative workspace but to provide closed rooms and flexibility for those times that you need them for a phone call or a private meeting. This was one of the biggest cultural shifts in physical space for IdeaPaint. A peek into the side of the space where the sales, marketing, and customer experience teams sit. Photo by Neil Alexander. The heart of IdeaPaint’s new space is the aforementioned hive that integrates the whole office—the axis of interaction in an environment that forges connection at every level. First and foremost, there’s the connection between and among IdeaPaint employees, then there’s the connection and interaction with the walls, and finally, connection between IdeaPaint employees and walls with the outside. “What we really found spectacular about this space was the street level location, and the way we really looked at it was, how do we not only provide a space that has lots of light and provides a great working environment for the people who are in here, but also, can show off what we do as a brand,” said Stephans. It’s all about the energy. The new office fosters this creative energy and buzz that really gets everyone engaged in the space and excited about what they do. On top of that, the conspicuous branding helps the A&D community, end users, and other influencers who come into the space to connect with the brand by immediately understanding how the product works. “The better we represent the brand, the better our potential and current customers can see the possibilities in their own spaces,” said Stephans. The view from the finance and operations side into the hive. Photo by Neil Alexander. The walls say it all: IdeaPaint’s headquarters allows them to practice what they preach. They’ve seamlessly blended the brand into both a working showroom and an office environment that suits their company culture; the move to Boston has given them an edge in attracting and retaining talent; they’ve struck a balance between private and open, collaborative spaces; and they’ve left room for growth by emphasizing flexibility in the new space. A special thank you to Jillian Erhardt for her graphics work on the case study PDF, and to Lost Note Productions‘ Jason Cheung for his work on the video. Work Design NOW 2014 was sponsored by Haworth.